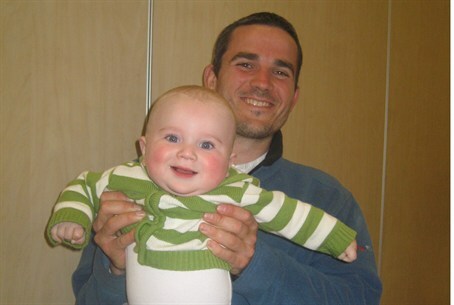 Two terrorists arrested for the killing of Asher Palmer and his infant son Yonatan. Three others arrested for stealing Palmer's gun. It was cleared for publication on Thursday that the Israel Security Agency (ISA) and the IDF have arrested two Arab terrorists from the Halhoul area, north of Hevron, who admitted to having thrown the rock at the vehicle driven by Asher Palmer on September 23. The car overturned from the impact of the rock, killing Palmer and his infant son Yonatan. At first, it was reported that the two were killed in a car accident caused by human error and not by a terror attack. This determination was made despite evidence that at first failed, for unknown reasons, to convince police that terrorists may have been involved: a hole in the front windshield of the car, a massive rock found in the front seat with human blood on it, a tear in fabric of the steeling wheel cover and dust indicating a blow from the rock, and damage to Asher Palmer's face suggesting an impact unrelated to the crash. An autopsy and a CT scan of Asher Palmer’s face showed evidence of facial fractures caused by a rock, causing authorities to determine that the accident was a terror attack. The Palmers were subsequently recognized by the Defense Ministry as victims of terror. As part of the investigation, three other Palestinians Authority Arabs were arrested, and admitted that after the attack they approached the car and stole Asher Palmer’s handgun. The gun was seized by the authorities during the investigation. The ISA said on Thursday that the investigation is still under way and put a gag order prohibiting publication of the identity of the detainees, as well as any other details of the investigation. “This is proof that the phenomenon of rock throwing that has recently overtaken roads in Judea and Samaria is not negligible acts by Arab children, but rather Arab terrorism whose declared aim is murder of Jews,” they added. “This new and lethal operation system requires the IDF to act to eradicate this phenomenon with all its might, and even consider a ban on Arab travel on some roads in order to ensure the safety of Jewish residents,” concluded Katz and Ariel.